The conclusion provides an overview of the major findings from previous chapters. It notes how green lifestyle media present sustainability primarily through commercial contexts and processes of consumption although equally it is noted that sustainable everyday life must necessarily engage with material culture. It is also observed how narratives of green lifestyle media enable pedagogical functions involved in processes of cultural governance where individuals seek self-improvement in their quests to live in a more sustainable manner. The conclusion also reviews those instances where environmental subjects use media, and particularly social media, in strategies of self-representation. 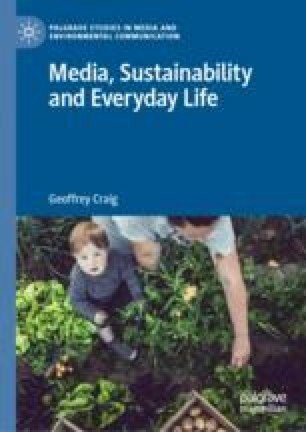 It is also highlighted how an important feature of green lifestyle media is its tracing of the everyday networks of un/sustainability across stages of production, distribution, and consumption, connecting the domestic and the local to wider societal contexts. It is finally observed that there is great variability in the media representations of subjects who are at various stages of ecological consciousness.